___ This hugely popular, award-winning and self-initiated FL@33 project is presenting a collection of onomatopoeia from around the world using sound recordings from native speakers imitating the sounds of mainly animals and vehicles. The online collection focuses on the pronunciation and comparison of these sounds by presenting them side by side as each language expresses them differently. 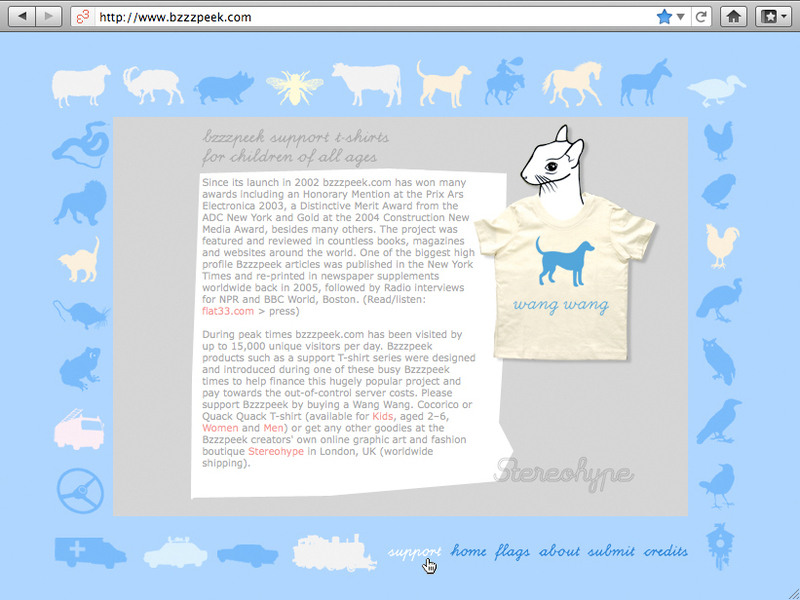 Bzzzpeek.com was launched in September 2002 and has since been featured around the world in countless books, magazines, newspapers and online. High profile features also included The New York Times and NYT supplements in other international newspapers followed by FL@33 radio interviews with NPR – National Public Radio and the BBC World (Boston). ___ Unique visitor counts to this online project have naturally been peaking during those busy times and Bzzzpeek's record so far were months when we enjoyed attention by up to 15,000 unique visitors per day. ___ The project has won many international awards including an Honorary Mention at the prestigious Prix Ars Electronica, a Distinctive Merit Award from the ADC – Art Directors Club, New York and Gold at the Construction New Media Awards, besides many others. 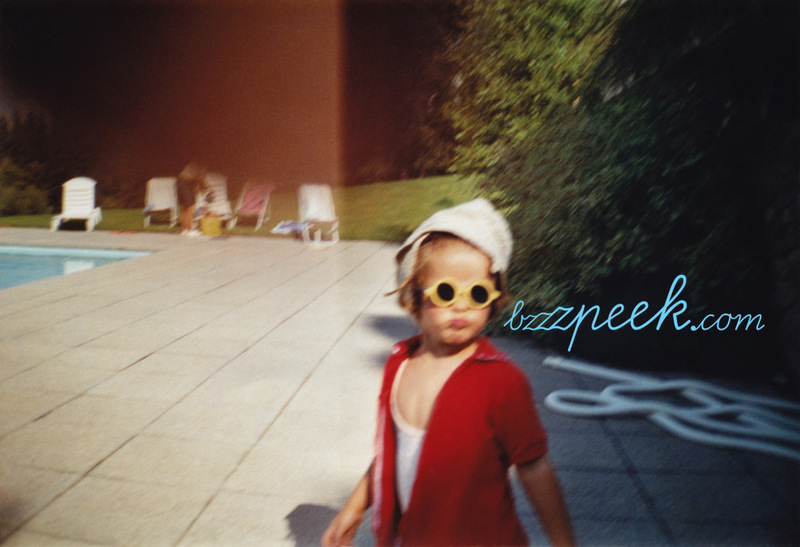 ___ Please visit our Press archive for in-depth Bzzzpeek articles and radio broadcasts of Bzzzpeek features and FL@33 interviews. 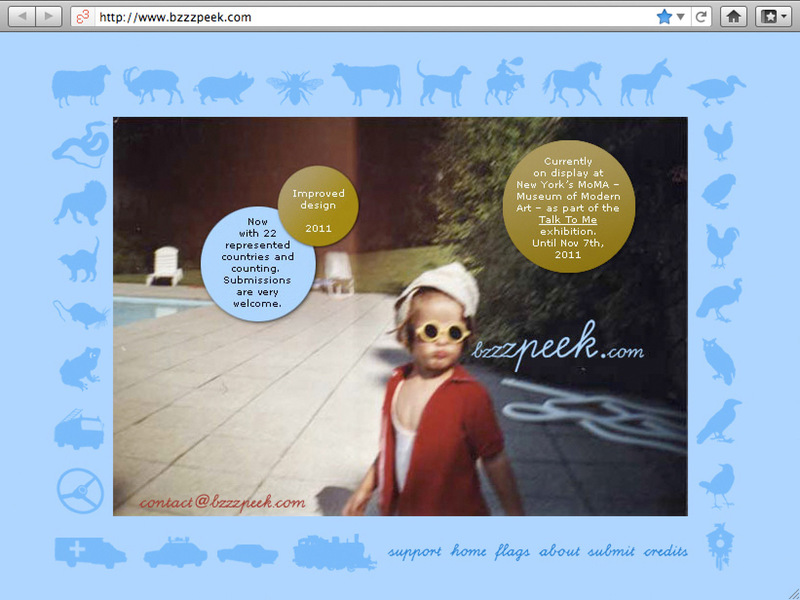 Bzzzpeek.com was selected for inclusion in an exhibition entitled Talk to Me at New York's MoMA – Museum of Modern Art where bzzzpeek's interface was on display from July 24th until November 7th, 2011. Talk to Me: Design and the Communication between People and Objects was organised by senior curator Paola Antonelli and curatorial assistant Kate Carmody. The website's design was improved in 2011 for this occasion. Up-to-date offline versions of the website are also available for schools and other educational non-profit institutions. Just get in touch if you are interested for your class / event. Bzzzpeek products such as a support T-shirt series were designed and introduced during one of the busy Bzzzpeek times to help finance this ongoing project and pay towards the out-of-control server costs. You can choose between Cocorico, Wang Wang and Quack Quack – all available for women, kids and men. Thank you! "Agathe Jacquillat and Tomi Vollauschek have created a project which is both fascinating and engaging whilst being educational. It makes use of the international nature of the Internet, the ease of introducing user-generated content and the commonality of sounds. It compares in a charming and inviting way the differences in children's sounds between cultures for a number of everyday things."